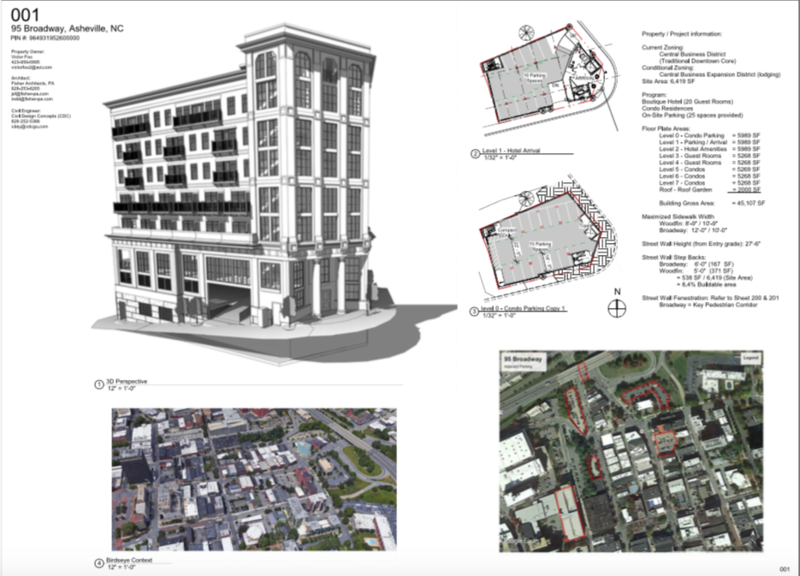 A new “condotel,” a building that includes both hotel rooms and condominiums, called 95 Broadway Hotel & Condos is proposed for the corner of Broadway and Woodfin streets in downtown Asheville. The building would be seven stories tall and include 20 hotel rooms and 11 condo units. The address is 95 Broadway St.
95 Broadway Hotel & Condos is a proposed mid-rise hotel and condo building. 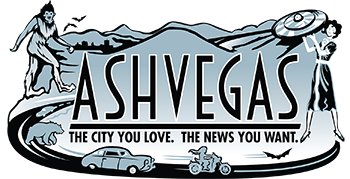 The locally owned and operated boutique hotel will offer 20 guest rooms, a large meeting room overlooking Broadway and a cafe offering leisure space suited for rest and connected time on your favorite portable devices. The hotel will be accessed with an on-site pull-thru to facilitate drop off and valet, as well as 10 guest parking spaces. The main entry is provided as a pedestrian activated corner at grade level of Broadway and Woodfin. A total of 11 one- and two-bedroom condos will be located on the floors above the guest rooms and will be supplemented with a parking space for each bedroom. The condo parking at the lowest level will be discreetly accessed from the alleyway directly behind the building. Oh, dear… That design is actually moderately attractive, *and* it echoes the forms and patterns of historic buildings nearby. That obviously just won’t do! The city has very strict mediocrity standards that must be adhered to, as we have seen in nearly every project built downtown in the past twenty years. Those standards state that if a structure is not to be built in the charmless and forgettable contemporary “Charlotte Boring” style as we see at the Hilton Garden and Hyatt Place, it may instead be ugly, as we see at the Green Mansion. And if it absolutely *must* make a stab at aping historic architecture, it is to do so in a manner which is cartoonish and offputting, as we see at the AC and Arras hotels. No, this won’t do at all. Send it back and demand Charlotte Boring, or something that’s just an outright mess. We in Asheville have become accustomed to a certain caliber of architecture, and we won’t accept anything less! It is kinda weird, though. It’d be kitty-corner from the Masonic Temple, and the facing facade is a nod to that style, but nearly twice the height. I suppose that’s what you get when your footprint is 1/8 of an acre.